This report is based on the analysis done by considering the demand and supply trends of pecan in global market. It includes the scope of application for pecans and the growth of related industries. On a broader level, this comprehensive research report shows that, the food and beverage industry in North America is colossal and comprises and number of players in largely fragmented and multi-tiered supply chains. The industry is stringently regulated and players often have to adapt to a landscape that changes quite frequently. The primary demand drivers in North America are witnessing fast-paced evolution, as dietary habits receive emphasis, especially among consumers who scour every label to read the ingredients. Although mergers and acquisitions have been a staple in the food and beverage industry, uncertainties in political climate in Europe and America lead to a slowdown in 2016. As there is more clarity on the U.S. Presidential election and Brexit, the pace of mergers and acquisitions is likely to pick up. Pecans are tree nuts that are witnessing a rapid increase in the consumer base across the world. This growth is driven by many factors including rising awareness among people regarding the nutritional value and affordability of pecans. The different product types of pecans available in the global market include nuts, oil and flour. The market for these products is fast gaining traction as pecans are known to be a powerhouse of vitamins and minerals such as manganese, potassium, calcium, iron, zinc etc. 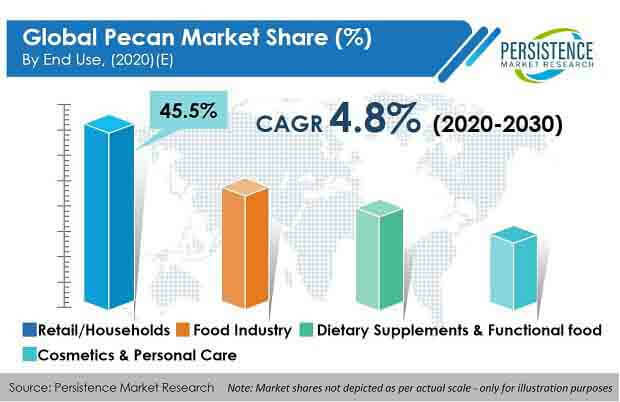 According to the forecast presented in this report, the nut form of pecans is expected to lead the market and hold a valuation of over US$ 2,800 Mn in 2026, growing at an exponential CAGR of 7.0% during the forecast period. The oil form is at the second position with an expected market value of just under US$ 160 Mn by the end of 2026 and a strong CAGR of 5.7% during the projected period. Pecans complement and enhance the taste of many food products. With their rich nutritional profile, good texturizing properties, and nutty flavor, they are ideal for bakery, confectionery, and snack recipes. Moreover, pecans can be consumed as halves, pieces, or powdered in the raw and toasted form, and these diverse options are often the reason why they have many applications in most food industries. On the other hand, the size of the pecans and whether they are available in shelled or in-shell form also affect their demand amongst consumers. They also have antioxidant properties, and due to the rise in health consciousness among consumers, the demand for any food that offers extended health benefits is expected to surge in the food industry over the forecast period. Given the high consumer base, pecans are expected to be used in many different applications and in different food products. All forms of pecans available in the global market including oil and flour will witness a high demand in the near future. In modern times, agriculture and cultivation techniques have become extremely intensive, due to which, plants have grown weak in defense to disease causing pathogens. Plant diseases have become prevalent amongst pecans, and the most economically damaging of these diseases is the pecan scab disease. Pecan scab disease affects the nuts, leaves, and shucks of the tree, and failure to curb the growth of the disease may incur huge financial losses and result in price fluctuations in the market, as was the case in the year 2013, when the production of pecans in the south eastern regions was only one-third of what was estimated, making pecan disease a major restraint to the smooth growth of the global pecan market. Furthermore, there are varying climatic conditions that are responsible for price fluctuations in the global pecan market. Low production of pecans results in a hike in product pricing, which may cause a downfall in global market growth.